Make someone’s day by giving them a glittering present with a bespoke inscription from our personalised glass and crystal gift range. Elegant and sophisticated, the pieces in our collection make superb birthday, wedding, anniversary, long service and retirement gifts, and you’ll be able to find something to suit even the tightest of budgets with ease. 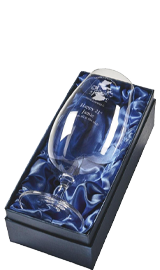 Our stunning giftware pieces are designed to make an impression and we’ve got something to suit every occasion. 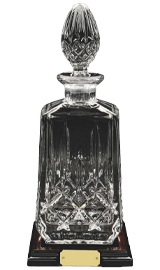 Whether you’re looking for an attention-grabbing bowl or vase for the victor of a sporting event, a sparkling decanter for a relative celebrating a milestone birthday, or a classy drinkware set in an attractive presentation box for a colleague who’s about to retire, you’ll find one in our online store. 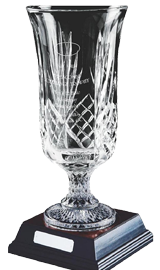 We stock stylish items crafted from lustrous lead crystal and from understated plain glass, including ornamental objects and functional glasses which stand on sleek wooden bases so they can be placed on display immediately. Breath-taking urns, practical tankards and pleasing brandy balloons – we sell them all at astonishingly low prices. 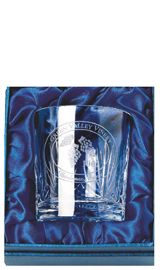 Adding your company logo to a piece of glassware or a personal message to the plaque on your chosen gift’s base is also a breeze when you shop with us. We have state-of-the-art engraving equipment and our talented staff members will use the latest techniques to ensure that your chosen product is individualised beautifully for an affordable fee. We’ll turn your order around quickly and can deliver items to addresses throughout the UK and the Republic of Ireland, so you’ll receive superb service when you buy a personalised gift from us. You’ll also find our online system simple and convenient to use, and we’re on hand to provide you with any help you need; just get in touch by calling 020 8722 0250 or emailing sales@challengetrophies.co.uk.